GE has an iconic name, but it isn't the same company it was before the 2007-to-2009 recession. General Electric Company (NYSE:GE) has an incredible history behind it, and it remains a large and important industrial company. But it is not the same company that it was thirty years ago. In fact, since the deep 2007-to-2009 recession, GE has been a company struggling to find its way. While it is highly likely to survive and thrive again, offering material upside potential, investors need to understand what they are buying when they invest in GE today. Here's a few key facts you need to know. 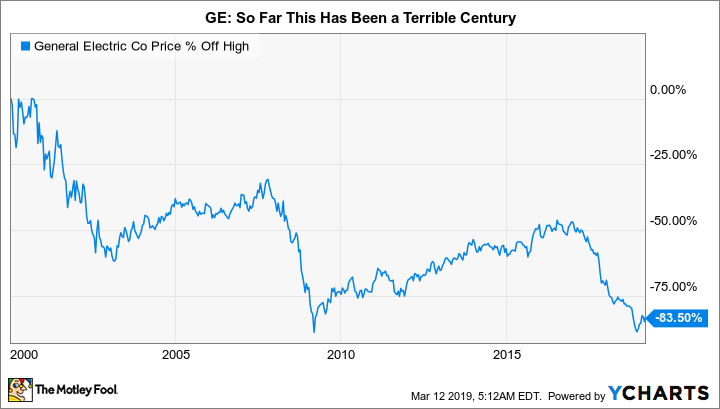 General Electric stock is down nearly 70% from its 2016 highs, a little over 75% from its 2007 highs, and more than 80% from the levels it reached in 2000. The stock trades hands today for about what it did at the worst of the recession, when there were real concerns about the company's ability to remain a going concern. Check out the latest earnings call transcript for General Electric. All of those declines suggest that GE has material recovery potential, noting that its core industrial businesses remain large and globally important in their specific niches. Although it is still unclear what businesses GE will retain over the long term, some of its divisions are actually doing reasonably well. The most notable is the aviation group, which saw year over year segment profits rise 20% in 2018. And while healthcare revenues and profits were only up 4% and 6%, respectively, this is a substantial business in an important growth industry -- with robust 18% profit margins. If GE can turn around some of its more troubled units, notably its power division, investors would likely, and perhaps justifiably, reward it with a higher share price. However, you can't lose sight of the big picture here. General Electric is attempting to turn its business around. It's likely to succeed, but there's a risk that it won't. Or that it will take longer, perhaps much longer, than investors expect. Progress along the way is unlikely to be smooth, with ups and downs driven by news, economic swings, Wall Street's inevitable gyrations, and good and bad financial results. That stock will rise and fall accordingly, often in dramatic fashion. Investing in a turnaround story isn't appropriate for conservative investors. Even investors willing to take on moderate amounts of risk should probably think twice before buying into a turnaround play. It can be hard to stick around through the entire process and sometimes turnarounds don't work out. GE, as a turnaround, holds both huge recovery potential and huge risks. On the fourth-quarter 2018 conference call, CEO Lawrence Culp said, "As my friend Jim Collins of 'Good-to-Great' fame might say, it's a start. But we have much more work to do." He was describing GE's progress in turning its business around and the statement was part of his prepared remarks, not an off-the-cuff comment. Ultimately, Culp was just being realistic and looking at the facts as they exist. Investors need to listen and take the cue. It would be wonderful if GE's business woes could be cured overnight, but that's just not possible. The asset sales it's undertaking to raise cash take time to work through. Debt-reduction efforts are great, but they only firm up the foundation, they won't cure the business of its bigger problems. And some of the company's most important divisions, notably the power business, are facing material cyclical headwinds that have to be worked through and GE has no control over the timing on an industry upturn. This isn't the beginning of the ride, per se, but the ride is nowhere near over. The next big thing to remember with GE is that it was the company's finance division (GE capital) that led to all of this trouble. Under Jack Welch, GE capital deviated materially from its basic purpose of providing financing to GE customers so they could buy the company's products. It strayed into banking-related spaces to such a degree that during the 2007-to-2009 recession it had to take a government bailout. That move was basically a way to calm Wall Street's concerns about its liquidity during a time when liquidity was tight throughout the financial markets. The company quickly created a plan to reduce its finance exposure after the financial crisis. That was and remains the right move. But, as you would expect, the best pieces were the easiest to get rid of. Which helps explain why the finance arm has time and again been a financial drain in the decade since the recession ended. That drain will include another $4 billion capital infusion in 2019. 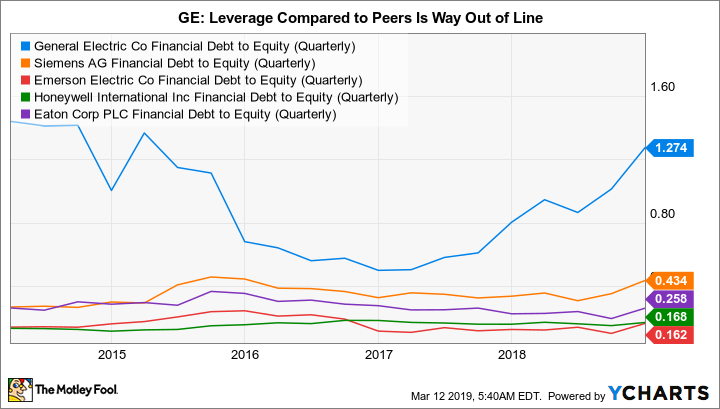 And while the company continues to pay down debt at its GE capital unit, it doesn't expect to get to its target debt levels until 2020. In other words, the problem that started all of this is still a problem. Worse, as an investor, you have limited insight into the troubles at the unit, which accounts for a significant portion of GE's roughly $95 billion in long-term debt (around 75% of the capital structure, excluding noncontrolling interests). It has a more leveraged balance sheet than most of its peers, as well. And since troubles at GE capital seem to pop up with painful regularity, it is a big wild card. You need to be ready for more, potentially unpleasant, surprises from GE's finance division. And if that weren't enough to worry about, it's worth remembering that GE is also subject to an SEC inquiry into the $22 billion write down of its acquisition of Alstom, a French supplier to the power industry. That, too, could lead to a troubling outcome. It's also reasonable, based on these two issues, to wonder if there are even more unknown unknowns lurking in the company's books. The cockroach theory (if you see one roach, there are more) suggests that additional issues could surface over time. None of this is to suggest that you shouldn't buy GE; it has an iconic name, sizable and important industrial businesses, and material recovery potential. A turnaround may require a long and painful revamp that leaves it focused on just its most profitable operations (like aviation and healthcare), but there are still real growth opportunities hidden in the mess that is GE today. If management can refocus on those, investors will likely be pleased with the outcome. However, this is not an appropriate stock for most investors. There are very real risks here and the turnaround process is far from over, a fact even the CEO has tried to explain to Wall Street. GE is only for investors who have a higher risk tolerance and are willing to stick around for what may be a very long time. If that's you, great. If you get a little queasy thinking about the ups and downs so far, don't buy GE -- the turbulence is far from over.